The Auburn Metropolitan Area—officially the Auburn-Opelika, Alabama Metropolitan Statistical Area—is a metro area in east-central Alabama with a 2016 population of 158,991. It was the 19th fastest growing metro area in the United States between 1990 and 2000. 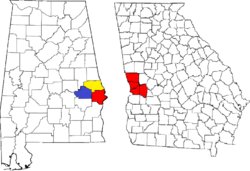 The Auburn Metro area consists of Lee County, and includes the cities of Auburn (population 63,118), Opelika (population 27,443), and the northernmost portion of Phenix City (population 31,100). ^ "Annual Estimates of the Resident Population: April 1, 2010 to July 1, 2016 - United States -- Metropolitan and Micropolitan Statistical Area; and for Puerto Rico". Retrieved May 28, 2017. This page was last edited on 8 August 2018, at 03:36 (UTC).